I broke my cardinal rule before going to Clyde’s Restaurant last week. It was 6:00 on Wednesday evening, and the girls and I couldn’t figure out where in Columbia we were going to eat before the Katy Perry concert at Merriweather. I have a very strict policy (being a host at a busy restaurant) of being sure I do not make a reservation just a few shorts hours before I come in. This time, I didn’t even give hours as a window. At 6:23, we finally decided where we were going to go, and the girls -- Stacey, Brandy, and Lindsay -- and I, decided we should make reservations. Since I have the “Open Table” app on my phone, I said that I would make the reservation -- for 7:15. Just 52 minutes before arriving. Shame on me. However, when we arrived at Clyde’s, they sat us within 10 minutes. Even though they had them packed in the place like sardines, 30 or 40 people standing around, inside and out, waiting for a table. But here we are, made a reservation just shy of an hour before, and they accommodated us with no problems. This started the meal off on the right foot. When we sat down -- in a cute little four-top right next to the bar -- we were approached by our waitress and a pitcher of water. We ordered some drinks, and she came back in about 10 minutes with them. When she returned with the drinks, we still needed a few minutes to order. Actually, I’m pretty sure everyone else knew what they wanted except me, naturally. The menu was filled with great looking items, such as an Asparagus Salad, Chorizo Sausage Sliders, and Grilled Yellowfin Tuna. Come to think of it, in retrospect, I should have opted for those three options. Regardless, I chose the Cheesesteak Spring Rolls for a starter, and the Seafood Paella as my entree. 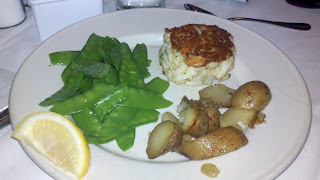 Stacey got the Crab and Artichoke Dip, Lindsay got a cup of Cream of Crab soup, and a Goat Cheese Salad (complete with strawberries, candied pecans, spinach leaves, and basil vinaigrette), and Brandy opted for the Crab Cake Platter with fingerling potatoes and snow peas. My cheesesteak spring rolls came out first, and they were served with a “jalapeno ketchup” -- which was just plain ole’ ketchup, and a roasted tomato mayonnaise. I’m not a fan of mayo, but it was tasty, and at least it was actually what it said it was. Hey, maybe the jalapeno ketchup was supposed to jalapeno, but I just didn’t taste it. Either way, the spring rolls were crunchy, and fried until perfectly done. They were filled with a mix of red and green bell peppers, mushrooms and onions, thinly sliced steak, and provolone cheese. I couldn’t tell whether they were hand rolled, but they were good, nonetheless. However, nothing overly spectacular. Lindsay’s soup came out and looked more “brothy” than “creamy”, but still had good taste. When our meals all came over, I was pleased, overall. I had never had Paella before, but it was filled with mussels, crabmeat, shrimp, scallops, and tasty orzo. The taste of the saffron (one of my favorites spices) and the peppers and tomatoes, together with the orzo was perfect. The dish was supposed to come with salmon, but I opted to get it without, however the rest of the seafood was cooked very well. The best part about the paella, and I think something that makes it pretty signature for Clyde’s, would be the chorizo they incorporated. 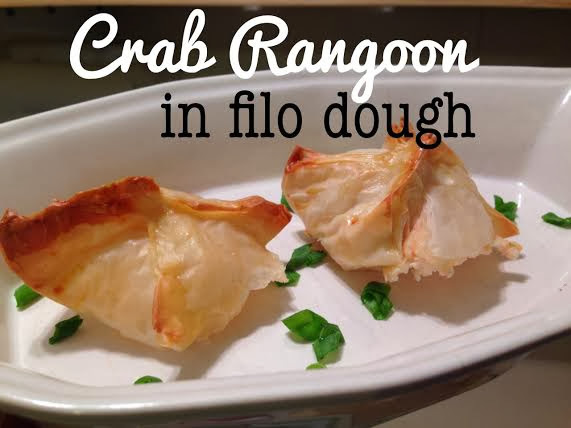 It was the perfect touch for a different texture in the dish, and added a great spicy kick with the seafood. Stacey ordered the crab dip as her meal. I thought it was very tasty, however, we both agreed the taste of black pepper came out very strongly in it... and if not for being a heavily creamy dish, would have taken over the whole dish. The artichoke hearts were a nice touch, though, and gave it some good flavor. Lindsay’s goat cheese salad looked really great! It was topped with fresh sliced strawberries and crumbled goat cheese which was a good combo... however, the candied pecans were absolutely fabulous! They tasted like they were caramelized and then toasted, and then sprinkled with sugar. I could have eaten a bowl of them for an appetizer. 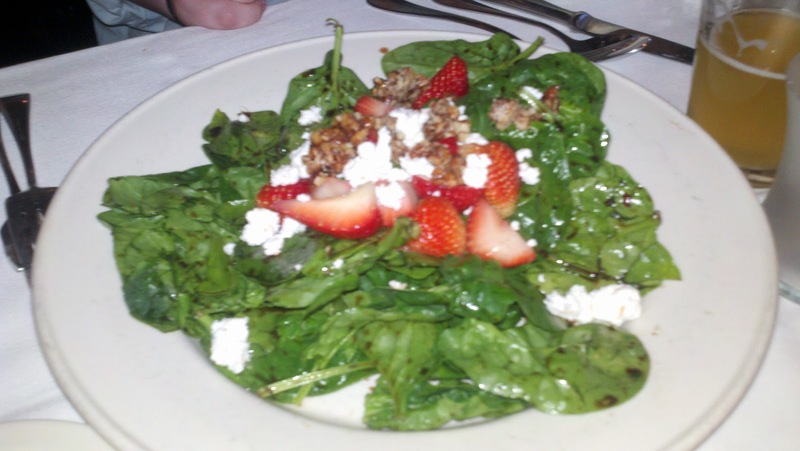 If I ever go back, I will be sure to try this salad. Brandy got the crab cake. Now, I have not tried anyone else’s crab cake besides Pappas’ and Milano’s of Parkville, so I wasn’t quite sure what this would be like. It came out flatter than I imagined they should be, but, Brandy said they were good. 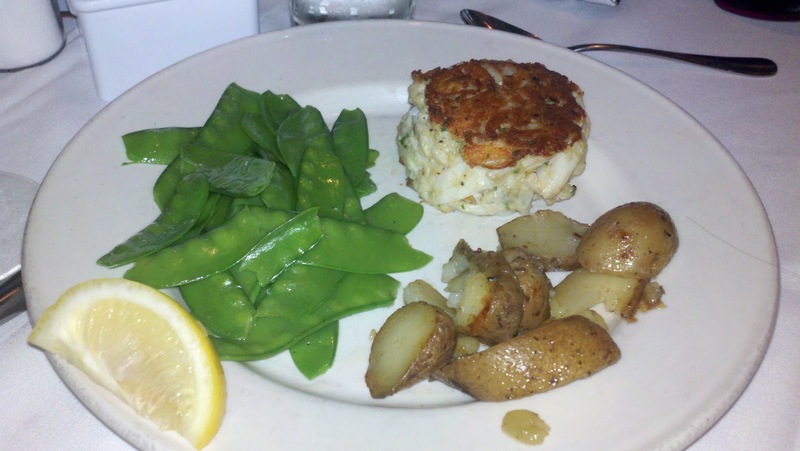 She had been there once before, and had gotten the crab cake, so to come back for a second time and get the same dish -- that’s gotta say something, especially considering all the other delicious looking menu options. I also ended up trying one of their specialty cocktails, and even though the price was incredibly steep ($9.25!! ), it was so delicious. “Sweet Caroline” was made with Firefly Sweet Tea Vodka, Cranberry Juice, Lemonade, and Peach Schnapps. I have already started making them at Pappas! All-in-all, dinner was really great. Despite all of the people there (the place was PACKED), we were able to sit, get drinks, appetizers, and entrees, all in about an hour and a half. 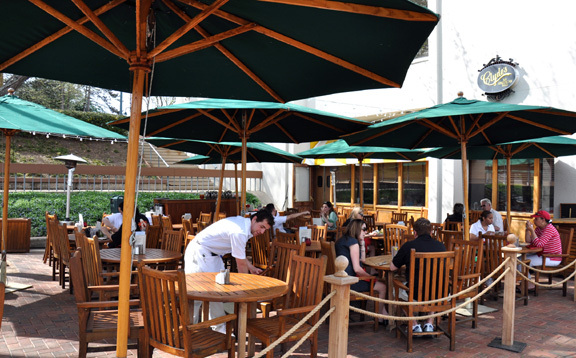 Clyde’s Restaurant sits on a beautiful lake and is equipped with outdoor seating. They do not take reservations for outdoor seating, but it appears to be worth the wait! 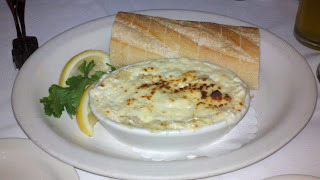 I would definitely go back to Clyde’s, because of the fun the atmosphere, the good food, and the good service.